This program is specifically designed for people who wish to have a close encounter with this majestic animal. During this half day program you will be able to walk with this amazing animal whilst enjoying the scenic envi-ronment. This special opportunity allows you to bond with your elephant at the same time learning its behavior, feeding habits and bathing ritual. Be prepared to join your elephant for a river bath and wear comfy shoes, as you will be walking for about 1.5 hours whilst finding food with the mahout. Bring your travel pillows to mount the elephants. Our tour includes lunch and a brief introduction about the lives of the Sri Lankan Elephants. This is a once in a life time opportunity for you to bond with one of the world’s most majestic animals. Take those videos and pho-tos that will be with you forever. For further information on rates please contact us and should you be looking to volunteer we would love to hear from you. Please be advised there is no riding of the elephants included in this pro-gram. Why Not Try Something Truly Unique This Holiday and take a Sri Lankan Language Class or Maybe a Cooking Class – why not do both – Here at Green View – We offer everything. Learn the basic Language skills you require to travel our country. Language classes will build your basic vocabulary and help you with everyday challenges ie. Changing money, negotiating rates and taxi fares, shopping and airport transfers. Learn the art of Sri Lankan cooking. Enjoy the experience of creating true Sri Lankan dishes with authentic ingredi-ents and mouthwatering flavours. We offer Vegetarian dishes should you prefer and just think how impressed your friends will be when you get back home and whip up a traditional Sri Lankan Dish in your own kitchen. These classes are conducted as individual, couples or as group. Per person cost for the program is Rs 2500 (17 USD) after cooking you will sit down to enjoy lunch together. The program includes fresh fruit juice, lunch and a recipe leaflet to take home. The earning of this program will be used for animal welfare and however further donations are greatly appreciated to help us fund our animal welfare programs. Use your own mind to face obstacles and see the reality of life. Through logical thinking and passionate living overcome your stress and anxiety and control your own life and live your way using Buddhist philosophy. combined with good karma and healing properties. Lets start simple. basically you are not asked to do any special tasks or anything out of the box. All techniques are very practical and simple but yet very effective. To discover yourself and your own expectations attend our 2 hour discussion and feel the difference. Green view, we have already a project to protect and care for stray animals, what we do is to save them against all their problems, we vaccinate them, treat their wounds with the assistance of a good veterinary and already we have five dogs and two cats they are well fed and looked and they are now part of our family. Now our aim is to help the wounded and stray dogs and cats in our area, care them like our own, we have already organized to feed them and also to sterilize and vaccinate all animals .in order finance such a project, I have organized a souvenir sales of Sri Lanka products such as spices, oils etc. Other aspect of this project is to help low income population in village with assistance of the government officer in charge of the affairs of the village known as Grama Niladhari. Under this project children of poor families are encouraged to produce their creations of handicrafts and paintings which are sold by us for their benefits. At the moment, Sri Lanka only allows certain groups to benefit from tourism in touristic cities. 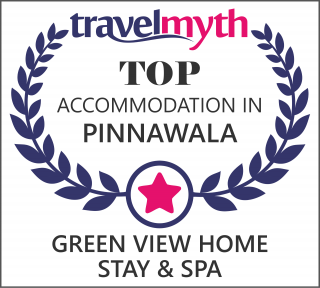 Green View has a vision always to bring the tourism to the village level and support local community, in terms of enhancing and enriching local villager’s life and their knowledge and also let them mingle with tourists. This way both tourists and locals get a chance to share their life-styles and understand cultures and values. There are a few programs we are currently working on and while you stay, you can take part in these projects and support this. Please visit our website for more details.